On Sundays, I go old school. I pick up the Sunday paper from my sidewalk, go inside, pour a cup of coffee, and read it. 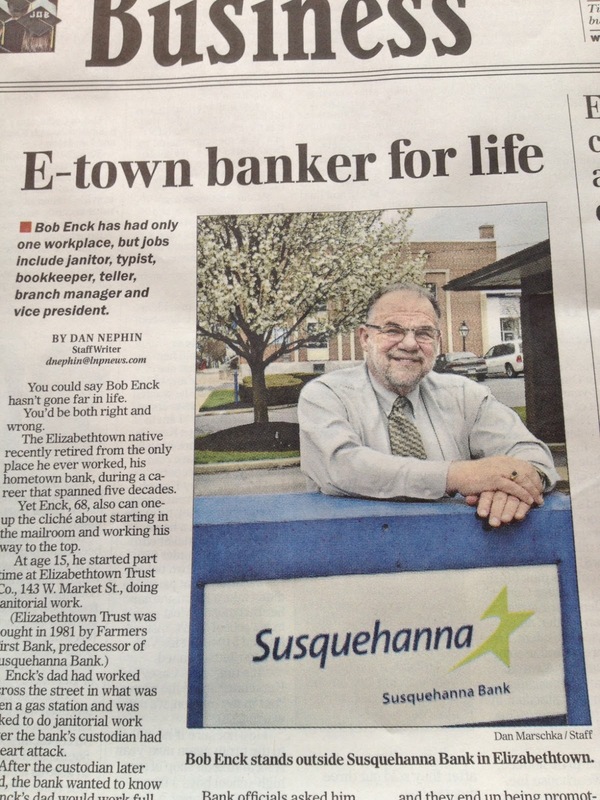 On a recent Sunday, the headliner in the Business Section was about the retiring Bob Enck, a long time community banker in my hometown, Elizabethtown, Pennsylvania. Bobby Enck is a relic of an old time era in banking, when you started and finished your career at the community bank in the center of town. 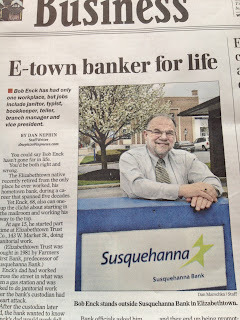 Bob started at the Elizabethtown Trust Company, which was aquired in 1981 by what is now Susquehanna Bank. Did Bob climb the corporate ladder, and pick up stakes and move to the corporate headquarters 20 miles away. No. Did he stop burning shoe leather and shaking hands in E-town. Again, no. Bob works in the same office he cleaned when he was 15 years old, the old E-town Trust Company's headquarters. He served on the school board, helped found the ambulance company, and is raising money for athletic fields. There are precious few Bob Enck's remaining in community banking. As I often say, if you succeed in banking you move farther and farther from the customer. 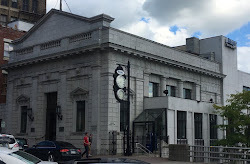 Recently, I was interviewing community bank Board members regarding their strategy, and one director lamented that nobody wanted to work in the branch. They all wanted to transfer to the back office. A situation I think is the rule, not the exception. But bankers keep telling me they want to erect the foundation of their bank around customer relationships. If so, why do they foster an organizational structure that encourages distancing key employees from customers if they are to succeed? Susquehanna stuck with the market manager concept with Enck. I am unsure if they do it throughout their franchise, or they made exception in E-town. I suspect the latter. E-town Trust was a market leader when acquired, and the remnants of that franchise, namely Bob Enck, continue to lead the market (see table). They now have three branches in a town with 40,000 residents (one came by way of acquisition). Not all markets can support senior level support like Susquehanna's E-town market, where the bank boasts $190 million in deposits, larger than many community banks. But there is a case to be made that, if relationships are the core to your strategy, your bank should have senior, lifelong bankers in your market. That means you have to build compensation, incentives, and support around this strategy. Relationship building within communities requires time. Operating your branches with an employee revolving door doesn't get the job done. That is transactional bank thinking. Does your structure support your strategy? Do you know of other Bobby Enck's? Or should this old-school approach go the way of the rotary phone? Note: After posting this, a Susquehanna Bank executive called in a correction. They do pursue a market manager approach and work to replicate Bob Enck's throughout their franchise.